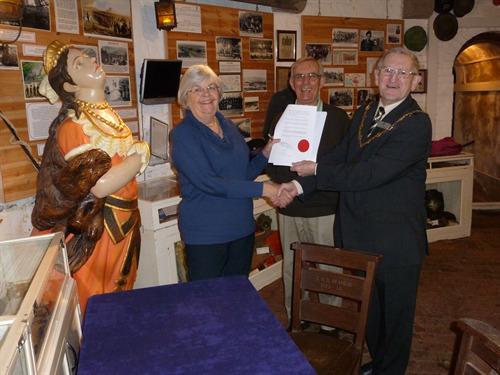 Seaford Museum secures their third decade in the Iconic Martello Tower! Seaford Town Council and Seaford Museum & Heritage Society are pleased to announce that the lease for Martello Tower, which has housed the museum since 1979, has been finalised. Seaford Museum & Heritage Society now has the security of a ten year rent free lease being in place. The Chairman and Secretary from Seaford Museum & Heritage Society, Kay Turvey and Mike Wright respectively, met with Mayor of Seaford, Councillor Mark Brown, at the Martello Tower to confirm the signing of the lease. The Society are undertaking a hugely important project to improve access to the museum in order to enable all residents and visitors to the town to be able to gain entry to the museum. The tower is an iconic attraction of the town and is vital to preserve the history and heritage of the town and local area. Now that the new ten year lease is in place this will enable the Society to apply for further funding towards the project. The Society has also recently been successful in registering as a charity limited by guarantee, which opens up their opportunities for seeking support with the accessibility project. Seaford Town Council is committed to helping secure the future of the Museum and Society where it can and apologises sincerely for the delays that have been experienced with getting the new lease finalised. The Council is looking forward to working in partnership with the Society in the future and ensuring that the needs of the community and town are met.